Girls, do you like clothes featuring a pattern: flowers, Scottish tartan, other? Just some examples: from a dress, over a skirt or pantyhose to shoes... just assembled an assortment of pics. So girls, do you like them and would you wear them? yes i do:) i do them regularly but i love it when i do. its usually tops or pants tho. I'm yet to own shoes or pantyhose with patterns. Interesting... I can also imagine the Australian climate would would not make you wear hose... I generally hear Australian girls describe wearing flip-flops year round. Shoes with airco hahaha! when it gets cold we do wear boots and all that other stuff. a lot of us also like to wear sneakers in summer. Haha, thanks for the explanation. I like to learn and to have some nice chats with my friends round the world... you always pick up some parts of the puzzle first and than get the image. i had someone think we rode to school in kangaroo pouches so its been worse LOL. Have you seen the video of the 2 boxing kangeroos? No joke, it happened and it looked like a real box match! Most helpful's all yours... you love to wear them and I love the view haha. What kind of nightwear do you wear when going to bed? White on white yay or nay? Would women act more humble if they didn't have their makeup masks? Should I make my eyebrows thinner or bleach them? Does this outfit looks good & appropriate to wear for Easter? Nice! And would you wear them on any clothe, from shirt over skirt to hose or any preference? I can imagine some of the things on the pic, even if they would show the patterns you like, would be a but of "overkill"? It's good that tose things differ a bit from person to person... if we'd all enjoy the same look life would be boring! patterns spice up your looks ! The many positive answers with regard to patterns confirm your opinion! I like all three of those photos, especially the skirt totally my style. Love the heels but I do not know how long I would last walking in them LOL! Haha, we'll find a flowery pair without heels! Just ask for help on GAG and you'll see how much advice you get. I see that you're new to the site so... welcome on board! oops didn't see the dress. 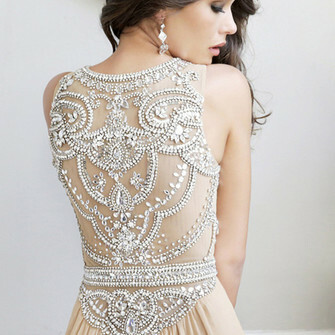 Dress is nice, a little too much "jeweled" action going on, but would be pretty for a wedding or a ball. I would wear all of those clothes other than the mini kilt. 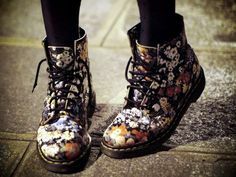 I really, really love floral pattern - I have floral Doc Martin boots because they're badass and pretty at the same time. Is this about what they look like? Cute! Do they attract guys? Or only bees hahaha? Haha no problem, interesting to hear! Isn't it difficult to find the right combination of all these patterns? I love tartan it's one of my favourite patterns to wear. I also like gingham. I had a look on google... I prefer tartan. I've often seen it when I visited Schotland 2 years ago and it's so cute especially for a skirt. I like tartan type clothes. Me too actually, when I visited Schotland I found it very very cute to see a girl in an outfit like the pic! Well, I'm Irish. We have similar styles. I wear all these things. Of course. And fortunately... if all would be wearing the same dress, hose, shoes,... it would become boring. The more variation the more exciting! That's true. Major reason I gravitate to artistic people. Well, it's alright, I'm sure you have many other talents. I personally only have one. Jep... I can drive a car and even fly a plane... but not draw a tree hahaha. Home > Fashion & Beauty > Girls, do you like clothes featuring a pattern: flowers, Scottish tartan, other?